MISSISSAUGA, ON (April 19, 2018) – Walmart today announced a commitment to achieve zero food waste by 2025 in its Canadian operations, in accordance with the Zero Waste International Alliance guidelines*. To address this significant issue more broadly, the Walmart Foundation is also donating $15 million USD (~$19 million CAD) in funding to support Canadian initiatives and research to reduce food waste along the food chain, from farm to fork. Today’s announcements build on business and philanthropic initiatives the company has been undertaking since 2005 in Canada and around the world to eliminate waste and relieve hunger. 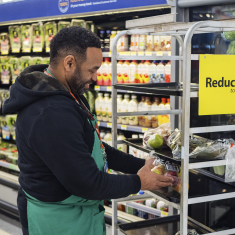 In Canada, Walmart has reduced food waste in its own operations by 23 percent between 2015 and 2017. The company’s journey to zero food waste in Canada by 2025 will continue to be guided by a three-part strategy. Increasing food donations: All Walmart Canada stores will be paired with local food banks to maximize surplus food donations, with approximately 85 per cent of stores regularly donating their surplus food products. Through a similar program in Walmart US, Walmart has been able to provide millions of pounds of much-needed fresh food into the charitable meal system. Providing philanthropic support: Walmart Canada has committed $1 million CAD to Food Banks Canada for the 2018 Fight Hunger. Spark Change. campaign in support of food banks across the country. In addition to the efforts of Walmart, the Walmart Foundation will invest $15 million USD (~$19 million CAD) across Canada in not-for-profit organizations engaged in research and innovative initiatives to reduce food waste all along the food chain. We hope this philanthropic capital catalyzes new approaches, end-to-end, such as whole crop utilization and consumer behaviour change to reduce food waste from farm to fork. $621,600 USD granted to create a roadmap that will present a deeper analysis of food waste and loss across the supply chain by region, sector and food type, and will include insights on the causes of food waste and loss. This information will be used to outline potential solutions that could reduce food waste and loss through prevention, recovery and recycling. $1.5 M USD in funding for FoodRescue.ca, an online system that provides access for businesses to quickly and easily donate surplus food of any kind, such as perishable dairy, prepared foods, produce, freshly baked products, as well as packaged and canned goods. Acting like the spokes of a wheel, FoodRescue.ca builds connections between food donations and social programs through timely and reactive software that considers organizational needs, such as distance and capacity. There is no cost for businesses or charities to use this online tool. Daily Bread Food Bank: $726,352 USD granted to enable Daily Bread to work with five large food banks in Ontario to help with the distribution of fresh produce across the province. Funding will be used to purchase a tractor trailer to transport the produce, a cooler to store the produce and a blast chiller to allow Daily Bread to pack and freeze smaller amounts of produce for distribution. Greater Vancouver Food Bank Society: $833,929 USD granted to scale up a social enterprise utilizing surplus produce and turning it into nutritious products. These products will either be distributed to people in need or sold at a low cost to non-food bank partners. $563,000 USD granted to convene best practices from key municipalities that have initiatives focused on reducing household food waste and conduct a deeper level evaluation of interventions in two regions. $459,886 USD granted to fund the development of a low-cost nutritional supplement from fruit by-products that normally would go to landfill. This research will specifically focus on addressing the issue of waste in the banana supply chain. Food Banks Canada: $2,310,000 USD granted to allow Food Banks Canada to foster greater collaboration, build skills and share best practices across its network. The grant will also fund the improvement of basic technological infrastructure and improve cold chain capabilities, as well as allow for the hiring of regional and national level staff to cultivate and manage new food donors for food banks in the provinces in which they work. Recycling Council of Ontario: $273,700 USD granted to test the viability of a co-operative model that offers its members simple options to recover edible food and divert compostable food waste material from disposal. A local consolidation site will offer co-op members convenient and cost-effective pick-up and drop-off for service providers that take food and packaging materials from the site, including food recovery organizations, organics processors, and packaging recyclers. If it meets qualitative and quantitative targets, the model can be replicated in communities large and small across Canada. Canadian Centre for Food Integrity and Provision Coalition: $520,049 USD grant to work with 50 manufacturers across Canada to conduct food loss and waste assessments, and identify solutions based on findings. Ultimately, this work will help identify effective strategies that can be implemented across the industry to reduce food waste and loss. Food waste is an important global issue, with substantial repercussions in terms of both food security and the environment. The United Nations Environment Programme reports that roughly one third of the food produced in the world for human consumption every year — approximately 1.3 billion tons — gets lost or wasted. In Canada, the cost of food waste was identified as $31 billion in 2014, according to a report from Value Chain Management International, up 15 per cent from 2010. Walmart and the Walmart Foundation are helping people live better by accelerating upward job mobility for the retail workforce; addressing hunger and making healthier, more sustainably-grown food a reality; and building strong communities where Walmart operates. We are not only working to tackle key social issues, we are also collaborating with others to inspire solutions for long-lasting systemic change. To learn more about Walmart’s giving, visit foundation.walmart.com. Walmart Canada operates a growing chain of 410 stores nationwide serving more than 1.2 million customers each day. Walmart Canada's flagship online store, walmart.ca is visited by 600,000 customers daily. With more than 85,000 associates, Walmart Canada is one of Canada's largest employers and is ranked one of the country's top 10 most influential brands. Walmart Canada's extensive philanthropy program is focused on supporting Canadian families in need, and since 1994 Walmart Canada has raised and donated more than $300 million to Canadian charities. Additional information can be found at walmartcanada.ca, facebook.com/walmartcanada and at twitter.com/walmartcanada. * Meeting or exceeding Zero Waste International Alliance business recognition program requirements, which include adoption of ZWIA definition of Zero Waste and achievement of 90 per cent or more diversion of all discarded resources from landfills, incinerators and the environment.